The Rebel Sweetheart. : For the Love of Vintage. 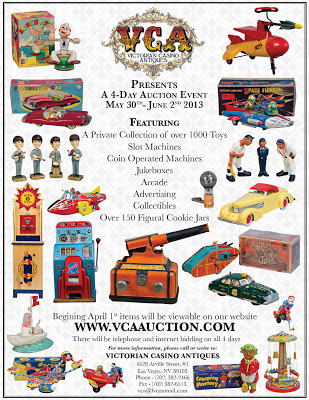 For serious collectors and antique enthusiasts, the Victorian Casino Auction is an event they surely wouldn't miss. Since the 1970s, Victorian Casino Antiques has become the standard in antique auction - not just in Las Vegas, but in the whole United States of America as well. Being the benchmark in the industry, Victorian Casino Antiques makes sure that their auctioned antiques are of top quality. They have even earned the bragging right as 'the auctioneer that has sold the most coin-operated devices across America'. Their upcoming 4-day auction, for instance, will feature an impressive array of collectibles. Slot machines, coin-operated machines, arcades, jukeboxes, figural cookie jars, to a private collection of over a thousand toys - there's sure to be something for every collector. I personally am drawn to the Bubble Blowing Popeye (made in the 1930s!) 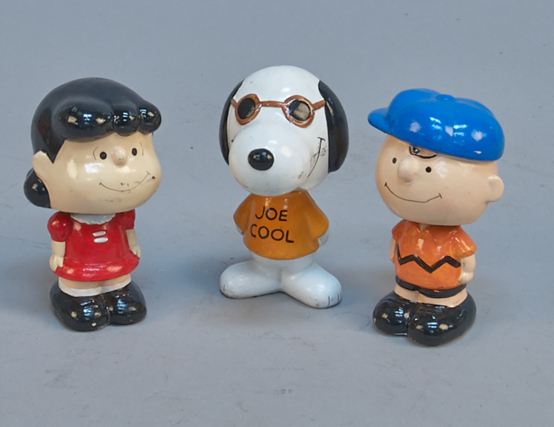 and the Vintage Peanuts Gang Figural Bobble Heads (handmade in Korea, circa 1950's!) found in their auction catalog. If given the opportunity, I will hop on a plane to Vegas and attend the auction myself! Lucy, Snoopy, Charlie Brown (1950). Although auctions are held just twice or thrice a year, the Victorian Casino Antiques Gallery welcomes visitors and collectors who would like to take a peek at the consignments. The VCA Gallery, located at 4520 Arville St. #1, Las Vegas, Nevada, is open from Monday to Friday 9am to 3pm, by appointment. I love finding photo graphs of old vintage toys online. Makes me wish some of them were still around. This are great collections of antiques. The Snoopy and Popeye figurine would really look good at home. ooh would really love to check this out! i am currently on the hunt for vintage home accents. Such a good collection.very nice. lovely collections! would love to scour the jukebox if ever haha that would be amazing! Vintage stuff is definitely worth the price. I love vintage stuff- from toys to furniture, and even clothes! I bet they will have some of my childhood faves at auction! I myself am "vintage".